When Cynical Cousin Dave unpacked a carton from Amazon and saw that it contained two books on “style,” he immediately expressed doubt about my heterosexuality. I had to explain to the Gen-Xer that I was not researching the proper length for cargo shorts or the merits of various grooming products. The stylebooks I received were about writing -- specifically the rules to achieve consistency and accuracy in spelling, punctuation, abbreviation, sports scores and more of the nitty-gritty that writers have to deal with any time they tap the keyboard. 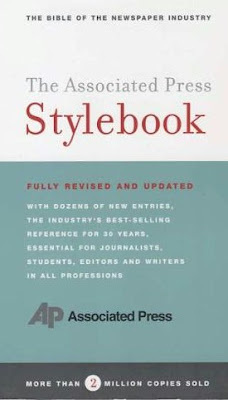 The Associated Press Stylebook was first published as a stapled 60-page booklet in 1953 and it became an important reference for the media members of the Associated Press, as well as many writers and even students. Over the years the "Bible of the Newspaper Industry" grew considerably in both size and scope. The 2007 version that I bought is still a rulebook, but it’s also a dictionary, encyclopedia and textbook. There are other stylebooks, most notably from The University of Chicago and the New York Times. Sometimes the three agree. Sometimes they don’t. Sometimes they disagree with popular dictionaries. You can pick which book you want to follow, or pick and choose bits and pieces from each. You can even disagree with all three and make up your own rules — if you have a good reason and don’t do anything too stupid. Besides accuracy, the main reason to use this book or your own homemade cheat sheet is to achieve consistency in your writing. Some rules are arbitrary, so if you follow the rules you won’t have to make a decision on the spot, and end up with “homemade” on one page and “home-made” on another. Don’t just consider this a book to be kept on a shelf until you need to check on a specific word. Spend a day or a week or a weekend with it. Read it cover-to-cover, flip through, or just stick your finger between two random pages. I promise you’ll be enlightened and maybe even be entertained. Cynical Cousin Dave and I have endured and enjoyed a long-term battle about his sloppy generation saying “jive” instead of “jibe.” I checked the entry for “jibe,” expecting to find a warning about “jive.” There was no warning, but Dave and I did learn a new word, “gibe,” to add to the confusion. I won't explain it here. I want you to buy the book and look it up. One big surprise is that “B.C.” goes after the year number, but “A.D.” goes before. Yeah, right. The Stylebook also has extensive sections on writing about sports and business writing. I was surprised to learn that "firm" is not a synonym for “business.” It specifically means a partnership, like a law firm -- but not a corporation. There’s also a lot of info on media law, to help you get vital information and avoid being sued; and some specific references for handling photo captions and submitting news stories that probably won’t be useful in writing a book. List price is just $18.95, making it a very good value for a well-packed 419-page book. I paid just $12.89 at Amazon.